Written by two prominent nutritionists, "Intuitive Eating" focuses on nurturing your We've all been there-angry with ourselves for overeating, for our lack of willpower, for failing at yet another diet that was supposed to be the last one. But the problem is not you, it's that dieting, with its emphasis on rules and regulations, has stopped you from listening to your body. Written by two prominent nutritionists, "Intuitive Eating" focuses on nurturing your body rather than starving it, encourages natural weight loss, and helps you find the weight you were meant to be. To ask other readers questions about Intuitive Eating, please sign up. DIET is a 4 letter word. I wish, wish, wish that every one of my friends who struggles with her weight, thinks she should diet, or who mentally tallies in her mind what she’s eaten that day or that week to determine if she can eat that “cookie” (or whatever) would read this book. Before reading this book, I thought I was an intuitive eater because I lived by the mantra “eat when you’re hungry, stop when you’re full”, but reading this book has brought me a new level of peace with food. The basic premise of intuitive eati I wish, wish, wish that every one of my friends who struggles with her weight, thinks she should diet, or who mentally tallies in her mind what she’s eaten that day or that week to determine if she can eat that “cookie” (or whatever) would read this book. Before reading this book, I thought I was an intuitive eater because I lived by the mantra “eat when you’re hungry, stop when you’re full”, but reading this book has brought me a new level of peace with food. We should eat when we’re hungry, eat what we want that will truly satisfy us (lose the idea of what we “should” eat), and stop when we’re full. The primary goal established in this book is to make peace with food so it loses its power, a power I can relate to. Even though I believed in eating when I was hungry and stopping when full, often I would make a mental tally of what I’d eaten that day, or think that I “could” eat 3-4 cookies because of how far I’d run that morning. However, with intuitive eating, I’m learning to block out all the messages of what I “should” eat and how much is appropriate, and really dial into my body’s cues of what I need in that moment. And I’ve never felt healthier or had such a feeling of energy and well-being. Weight-loss can be a secondary goal of intuitive eating, but the authors, (two registered dieticians with Master’s degrees in nutrition) stress that you really have to be process-focused to make the process work. This means letting go of the scale or whatever metric you use to gauge your weight-loss progress. Instead you need to focus on you feel and the well-being you derive from the process of intuitive eating. Someone who has dieted frequently interspersed with periods of overeating will likely lose weight with intuitive eating until he/she arrives at her natural healthy weight. The authors have repeatedly found that to be the case with their clients. I can still hear the skeptic in you saying that if you were given complete permission to eat whatever you wanted, you’d be eating cinnamon rolls all day long, right? I have found through my experience that I actually crave sweets and baked goods at an all-time LOW. My theory is that because my body is constantly receiving the calories I need, I no longer crave desserts like I did before as an assured, quick way to meet (and in some cases exceed) my caloric needs. Additionally, when I know I can have sweets anytime (with full, sincere permission), I don’t need them as much. However, for me, I think the biological process is the more real one for me. Meeting my calorie needs consistently reduces cravings and periods of overeating. The authors have found the same results in their practices; their clients generally arrive at a point where they eat 90% healthy foods and 10% play foods (their term for junk food) through intuitive eating. I love this process and wish I had found it sooner. I highly recommend this book. For my final pre-internship year, I'm going to be working with individuals with eating disorders. I figured I'd try something completely new. When I asked my supervisor what books she'd recommend as introductory readings, "Intuitive Eating" is where she sent me, telling me that it's the only self-help nutrition book out there that she not only tolerates, but actually likes. In short: her assessment is spot-on. People ask me for book recommendations fairly often (and I'm only a grad student, so I For my final pre-internship year, I'm going to be working with individuals with eating disorders. I figured I'd try something completely new. When I asked my supervisor what books she'd recommend as introductory readings, "Intuitive Eating" is where she sent me, telling me that it's the only self-help nutrition book out there that she not only tolerates, but actually likes. In short: her assessment is spot-on. People ask me for book recommendations fairly often (and I'm only a grad student, so I'm guessing it'll get more frequent). It's a tricky question because so many books are so deeply cheesy, and I'm not exactly going for "deeply cheesy" as a psychologist-in-training. Well, hallelujah. "Intuitive Eating" is not cheesy. It is not patronizing. It is not preachy, simplistic, or annoyingly cheerful. It is compassionate, straightforward, and wise. It brims with good, old-fashioned common sense that is too often overwhelmed by the dieting hysteria that has gripped the U.S. for...well, decades, now. While I think overall, this and "Mindful Eating" are probably the best ways to care for one's health, this book was hugely repetitive and pretty obvious for anyone who's spent any amount of time trying to lose weight. + Pay attention to when you are hungry and full. Only eat when you are hungry. Don't eat until you are stuffed. + Don't diet. Plan on eating this way for the rest of your life and shelve that mentality of eating a certain way for 6 weeks to drop 20 pounds. + Don't put any foods on the "off limits" shelf. + Make healthy food choices, but choose foods you like. + Realize you can't reach a Size 00. Or basically read Appendix B, because that has everything in the book, minus the 16 trillion anecdotes and stories from supposed patients that sound suspiciously fake. (All the clients adopt this diet and suddenly, angels float down from heaven to carry them up with a basket of kittens farting rainbows.) Good grief, I get it - you want to sell this book and plan, so let's make up a bunch of stories of people who were fat or had bad body image, went to you, and suddenly life was a miracle. I started reading this book the other day and while it has only been a few days, I can see how much its ideas are transforming my life. Since I was a young girl I have struggled with body image, food issues, and disordered eating and my struggle has only gotten more difficult and more pronounced as I've gotten older, this book feels like it's the remedy I've been waiting for. I hate diets. They don't work and only serve to exacerbate my disordered eating and my unhealthy relationship with my body I started reading this book the other day and while it has only been a few days, I can see how much its ideas are transforming my life. Since I was a young girl I have struggled with body image, food issues, and disordered eating and my struggle has only gotten more difficult and more pronounced as I've gotten older, this book feels like it's the remedy I've been waiting for. I hate diets. They don't work and only serve to exacerbate my disordered eating and my unhealthy relationship with my body and with food and Intuitive Eating (as a book and a principle) is putting and end to dieting and setting me on the path to recovery. Intuitive Eating is not a quick fix, lose 15 pounds in two weeks, or a "lifestyle change" that comes with endless calorie counting and a strict usage of healthy alternatives. It is about fixing our relationship with food, with our bodies, with exercise, and with nutrition. It wasn't until I was reading this book that I realized just how disordered my thoughts were on food and dieting and eating, but I am taking the principles of Intuitive Eating to heart and I am using them to change my life and heal. I want to recommend this book to ANYONE who has ever compared their body to someone else, anyone who didn't have dessert because they didn't want to be "bad", anyone who has ever been on a diet, anyone who overeats or under eats or has ever judged food on a "bad" or "good" scale. I just want to stand on the streets and hand out copies of this book and wake people up to what we our doing to ourselves with our diet culture. This is actually my 2nd reading of this book.. I read it in 2015 as well. While I know that the 10 Principles are extremely valuable, it is so hard to change decades of food fear and disordered eating! I am working really hard toward intuitive eating. I have found that I go through phases of how I feel about food. This has always been true, but recently I find that my phases can change several times a day! It scares me as a recovering anorexic. My only option is to work one day at a time. Now that it's been almost 7 years since first being introduced to Intuitive Eating I can honestly say the concepts in this book actually really did change my life and allowed me to "make peace with food". I think I have the first edition (there are now 4) which although the writing is a little (okay a lot) hoakie the concepts are priceless. I do have to say I initially read this book as part of coursework while studying nutrition at USU so I never had the experience of picking it up and just rea Now that it's been almost 7 years since first being introduced to Intuitive Eating I can honestly say the concepts in this book actually really did change my life and allowed me to "make peace with food". I think I have the first edition (there are now 4) which although the writing is a little (okay a lot) hoakie the concepts are priceless. I do have to say I initially read this book as part of coursework while studying nutrition at USU so I never had the experience of picking it up and just reading it without dissecting. I greatly enjoyed this insightful, if slightly overselling explanation of intuitive eating, the authors' working method in the field of nutrition. Their approach is empowering and practical, and unique in the field. I believe that many, many people who struggle or have struggled with food will find something of value in this, whether you use parts of their ideas to supplement your relationship to food or commit to their complete process. First, an example. A couple months ago, I sat with a half-e I greatly enjoyed this insightful, if slightly overselling explanation of intuitive eating, the authors' working method in the field of nutrition. Their approach is empowering and practical, and unique in the field. I believe that many, many people who struggle or have struggled with food will find something of value in this, whether you use parts of their ideas to supplement your relationship to food or commit to their complete process. First, an example. A couple months ago, I sat with a half-eaten supper in my bowl, and I spoke out loud about the struggle I was having just then. I didn't want to stuff myself uncomfortably, but it seemed to be the only way I could have a satisfying supper. Gabe said to me, "You know, if you stop eating now, you can always eat more later if you get hungry." I could eat later? But there are rules! I can't eat too late in the evening! I then decided that my desire for a satisfying and pleasant supper experience was more important to me than following an old rule. I ate and I listened to my body with care, stopping when I felt full, knowing that I could get more later if I needed it. Since making the decision to do that frequently, I've gone from stuffing myself to discomfort at supper about 80% of the time, to doing it about 10% of the time. Without either of us knowing it, we were enacting a central tenet (and strategy) of this book. It is the authors' basic premise that our bodies can be trusted to know what they need and when they are hungry, if we can strip away the unhealthy conditioning we've taken in and stop second-guessing our bodies. For many of us, and for the authors' primary target audience, this means thoroughly understanding and letting go of the diet mentality in all its guises, and nurturing healthy, positive, productive self-talk. The key is completely removing ourselves from rules, which create forbidden actions and foods. These taboos can trigger a starvation response in us... which is surprisingly rampant in our culture of food abundance. By encouraging ourselves to know on a deep level that we can eat what we want and that we will not deprive our bodies, we free ourselves of primal triggers that have us battling scarcity thinking. By removing rules we have imposed on ourselves from the outside - from innumerable sources, many of them well-meaning - we can remove obstacles to hearing our own intuitive interactions with food. This is a fundamental trust in the wisdom of our bodies, something I deeply value. The book gives a psychologically sound framework for understanding some of the inner voices that can affect our relationship to food, and provides many different strategies for strengthening our own "intuitive eater." The book's content does sometimes get quite repetitious. But since we're talking about changing embedded beliefs, it's logical to review and repeat the pertinent ideas over and over again, to absorb them deeply. Before completing this book, a reader will have already had the opportunity to reflect on the ideas and dig out a few obstacles they may find to their own healthier eating habits. In a chapter towards the back, the authors address that group of individuals that have required another step before finding that inner voice -- those battling full-fledged eating disorders, that need interventions to minimize the threat before proceeding to the practice of hearing more subtle cues. The authors don't pretend to offer a easy-to-follow manual to exit out of such complex issues... but in addressing eating disorders, they have the same type of deep respect for the body and its survival mechanisms that Kate Bornstein did in "Hello Cruel World: 101 Alternatives to Suicide for Teens, Freaks and Other Outlaws". Both sources value all coping mechanisms as something sacred and imaginative, as creative problem-solving. When we start from a place of respecting the ways we manage our problems, we can look practically at what survival and health really mean, and how to expand our healthiest survival skills. I read parts of this book years ago, and began then to incorporate some ideas. I love getting the feedback from two trained nutritionists that a body's desires for food can be respected and trusted. At that point in my life, I didn't want to leave the more traditional strategy of counting calories and using math to get the pounds down. But now, I am more interested in feeling good and not fighting with food. They have convinced me that they have some great ideas that I want to incorporate into my lifestyle. "Bread is fattening, sweets are bad for you and no, I really shouldn't have a slice of cake, I've eaten so much already!" Who hasn't heard something like this before? It's funny to think about it, because with all that food and knowledge available to us, shouldn't eating be one of the easiest things to do? Objectively speaking it requires nothing more than following a basic instinct. But let's be honest, we all know it's a much trickier subject. Intuitive Eating gets rid of the diet mentality and "Bread is fattening, sweets are bad for you and no, I really shouldn't have a slice of cake, I've eaten so much already!" Who hasn't heard something like this before? It's funny to think about it, because with all that food and knowledge available to us, shouldn't eating be one of the easiest things to do? Objectively speaking it requires nothing more than following a basic instinct. But let's be honest, we all know it's a much trickier subject. Intuitive Eating gets rid of the diet mentality and is a book for people who have tried to lose weight before by obsessively monitoring what they eat. It is a great reminder of a way better option and possibly the only one that will make you happy in the long run: listening to your own body. "Consider toddlers. They are the natural Intuitive Eaters — virtually free from societal messages about food and body images. Toddlers have an innate wisdom about food if you don’t interfere with it. They don’t eat based on dieting rules or health, yet study after study shows that if you let a toddler eat spontaneously, he will eat what he needs when given free access to food." That dieting doesn't help to lose weight doesn't take a genius to figure out: if all it took to lose weight was a calorie-restricted meal plan, we'd be a nation of thin people, as Evelyn Tribole remarks. Interesting that people who fail to shed a few pounds will blame themselves - their willpower, or lack thereof, but not dieting in itself. But a diet requires linear thinking that can be toxic to the mind: one wrong step and you'll have failed your expectations. Tribole suggests a way of thinking that includes acceptance of there being ups and downs and recreating a good relationship with food being a process. This is, essentially, the way to eat. A lot of people do, naturally, it's not like a special, new-age restrictive idea. But for many of us, who see "Drop a Pant Size in 2 Weeks" and constant headlines on the obesity crisis, we can't help but be affected, to feel that something is wrong with us and we have to be perfect. PERFECT. We have to look like this-- on top of being this, acting like this, and anything less means that something is wrong. We don't have enough "will-power". I love what this book is saying, but it is VERY 80s-feeling. The gist of the "program" - eat when you're hungry, stop when you're full, and stop guilting yourself when you eat what you TRULY want. I think modern studies about the addict-ability of processed foods makes this slightly less factual. The authors claim the reason you overeat is because you've either been starving yourself, or you're planning to starve yourself, or you're thinking "oh well! I've already had one! Everything is ruined!" I love what this book is saying, but it is VERY 80s-feeling. Absolutely fantastic and such an important topic that covers a wide range of food issues (we all have them). I feel like I’ve been hypnotized by the concepts presented here, in the most positive, affirming way. I want to recommend this to every single woman I know. I came across a mention of this book on a blog and thought it sounded interesting. It's about losing the diet mentality and having a healthy relationship with food and our bodies. The book is geared toward chronic dieters, which I am not. I don't think I've ever seriously dieted. Sometimes I'll focus on smaller portions or eating healthier, but I'm not about denying myself foods or counting calories. If I'm hungry I eat. Even though it's not written with me in mind so much, I got some useful and I came across a mention of this book on a blog and thought it sounded interesting. It's about losing the diet mentality and having a healthy relationship with food and our bodies. The book is geared toward chronic dieters, which I am not. I don't think I've ever seriously dieted. Sometimes I'll focus on smaller portions or eating healthier, but I'm not about denying myself foods or counting calories. If I'm hungry I eat. Even though it's not written with me in mind so much, I got some useful and interesting things out of it. While reading it I was more aware of my eating habits and learned interesting things about myself that I hadn't realized. I noticed it's not hard for me to wait until I'm hungry to eat unless I am stressed out. Then I just want to eat. I realized if I take smaller amounts and really think about if I'm satisfied before getting more, I usually am and don't need more. I learned that I have a tendency to want to eat food just because it's available and yummy, whether I'm hungry or not, like at a buffet. I don't like letting food go to waste and tend to clean my plate. I liked the author's comment that it's not going to waste, it's going to waist. The book helped me shake off some of those behaviors, at least while reading it. Since I finished it over a month ago, I've become somewhat less conscious again. 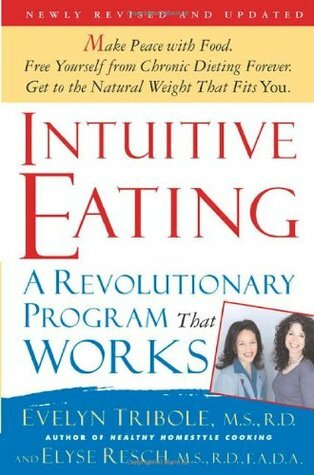 I feel convinced to try intuitive eating and I feel more prepared to do so, having read this book. That said, this was written in the mid-90s and really shows it. I would love an updated book that has fat acceptance and health at every size principles at its core, rather than as asides. I want an overtly feminist version of this book, too. I think we know more about nutrition now, and the specific fad diets that people try are different now, so an update on that would be great. But, I have some I feel convinced to try intuitive eating and I feel more prepared to do so, having read this book. 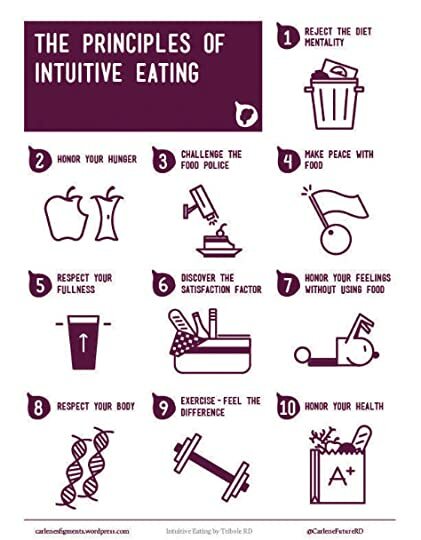 Intuitive Eating already provides an excellent summary as appendix to the book and very worthwhile details including the science behind intuitive eating. However, as per usual, I’ve taken notes for my own reference and, of course, I’d like to share. Note many sentences are word-for-word, I’ve simply condensed it to the main parts. Get angry at the lies that have led you to feel as if you were a failure every time a new diet stopped working and you gained back Intuitive Eating already provides an excellent summary as appendix to the book and very worthwhile details including the science behind intuitive eating. However, as per usual, I’ve taken notes for my own reference and, of course, I’d like to share. Note many sentences are word-for-word, I’ve simply condensed it to the main parts. The problem is that dieting thoughts usually translate into diet-like behaviours, which becomes pseudo-dieting or unconscious dieting. Examples include meticulously counting calories or carbs; eating only “safe” foods; eating only at certain times of the day; paying penance for eating “bad” foods; cutting back on food, especially when feeling fat or a when a special event comes up; pacifying hunger by drinking coffee; putting on a “false food face” in public; competing with someone else who is dieting … feeling obligated to be equally virtuous; second guessing or judging what you deserve to eat; or restricting any food for the purpose of losing weight. One food, one meal, or one day will not make or break your health or your weight. It can feel scary because it’s been the only tool you have known to lose weight (albeit temporarily). Let go of the false hope and disappointments from dieting. You’re bound to defy external factors and authority figures. Only you can know your internal wisdom and be empowered. - Forget about willpower, being obedient, and failing. Discipline only works when it aligns with deep beliefs. Rebellion to rules is a normal act of self-preservation – protecting your space, or personal boundaries. When a diet doctor or a diet plan invades your boundaries, it’s normal to feel powerless. But, instead of feeling strong from rebellion, you actually feel out of control and miserable. You can’t fail at Intuitive Eating – it’s a learning process at every point along the way. Keep your body fed adequately to avoid a primal drive to overeat. Learning to honour the first biological signal sets the stage rebuilding trust with yourself and food. Neuropeptide Y (NPY) is a chemical produced by the brain that triggers our drive to eat carbs, the body’s primary and preferred source of energy. Food deprivation drives NPY into action making it easy to turn to a high-carb binge. It is naturally the highest in the morning or when under stress or when carbs are burned as fuel. Only about half the brain’s cells can use ketosis for energy so low carbs can lead to loss of lean tissue. Consistently denying hunger also desensitizes hunger signals so you can only “hear” hunger in extreme, ravenous states. This further conditions you to believe you can’t be trusted with food, because ravenous hunger often triggers overeating. Biological cues of satiety are also pushed to the extremes. Your body needs to know consistently that it will have access to food – that dieting and deprivation have halted, once and for all. Hunger sensations ranging from gentle to ravenous include: gurgling, gnawing, growling, light-headedness, difficulty concentrating, uncomfortable stomach pain, irritability, feeling faint, headache. Take care not to get overly hungry. A general guideline is to go no longer than 5 waking hours without eating. Fuelling up your carb tank in the liver runs out every 3-6 hours. Monitor hunger levels each time you eat, before and after. Is there any relationship between how much you eat and the length of time between eating? If your eating style leans toward grazing, you may just find you are hungry more often, such as every 2-4 hours. Nibbling sstudies have shown the release of insulin is lower to larger traditional meals of identical calories. The more insulin released, the easier it is for the body to make fat. The body may do some of its energy fine tuning over a period of days, rather than from hour to hour. This means you may feel full on diet types of foods, but the lack of energy catches up with you; the body wants to compensate. It’s not bad to follow taste hunger, practical hunger (planning ahead flexibly), and emotional hunger. Ironically, many are often amazed that what they assumed to be emotional eating, was in many instances primal hunger eating. But the out of control feeling of eating is nearly identical, whether it was triggered emotionally or biologically. If you tell yourself that you can’t or shouldn’t have a particular food, it can lead to intense feelings of deprivation that build into uncontrollable cravings and often, bingeing. When you finally “give in” to your forbidden foods, eating will be experienced with such intensity, it usually results in Last Supper overeating and overwhelming guilt. Give yourself unconditional permission to eat. This means throwing out the preconceived notion that certain foods are good and others are bad. No one food has the power to make you fat or help you to become slim. Eat what you really want. Eat without obligatory penance – personal food deals are not unconditional. When you truly free your food choices, without any hidden agenda of restricting them in the future, you eliminate the urgency to overeat. The most effective way to instill the belief yo can eat whatever you want is to experience eating the very foods you forbid. It becomes self-evident proof you can handle these foods, they have no magic hold on you or your willpower. With permission, you take the time to taste and may even find it’s not so desirable after all. It may take a few weeks for the desire to taper off. Removing deprivation diminishes the alluring quality, and instead, put food in a reasonable, rational perspective. Legalizing food is critical. Proceed at a comfortable pace. It takes time to build up trust in yourself. Before you proceed, please be sure that you are consistently honouring your hunger. A ravenous person os bound to overeat regardless of his or her intention. 2. Put a check by the foods you actually do eat, then circle remaining foods that you’ve been restricting. 3. Give yourself permission to eat one forbidden food from your list, then go to the market and buy this food, or order it at a restaurant. 4. Check in with yourself to see if the food tastes as good as you imagined. If you find that you really like it, continue to give yourself permission. 5. Make sure that you keep enough of the food in your kitchen so you know it will be there if you want it. Or if that seems too scary, go to a restaurant and order that particular food as often as you like. Once you’ve made peace with one food, continue on with your list until all the foods are tried, evaluated, and freed. Note you don’t have to experience each and every item- what’s important is to continue the process until you truly know you can eat what you want. Eating whenever you feel like it, without regard to hunger and fullness, might not be a very satisfying experience and might also cause physical discomfort. Attunement with your body’s satiety cues is an important part of this process. Just because someone makes an inappropriate comment does not make it true. Powerful ally voices: nutrition ally, nurturer, rebel ally, food anthropologist. The Rebel Ally helps protect boundaries – use your mouth for words instead of food in a direct but polite way. Ask your family to stay out of your food choices or amounts. Tell them they may not make comments about your body. The Food Anthropologist is a neutral observer without judgment. Keeping an intuitive eating journal gives it the data. The Nurturer reassures you you’re ok in a gentle voice, never scolding or pressuring. It can be the vehicle for most of the positive self-talk in your head. You were born an Intuitive Eater. Gradually, the Intuitive Eater will prevail over the dieter but there will be time when you’ll need to evoke one or all of the positive eating voices to help you get centred and in touch with your Intuitive Eater once again. There are no rigid rules in this process. It is fluid and adapts to the many changes in your life. The integrated Intuitive Eater is a team player that honours gut reactions, whether they are biological, satisfaction-based, or self-protective. Am I having repetitive and intense feelings? What am I thinking that’s leading me to feel this way? what is true or correct about this belief? What is false? Examine and confront the distorted beliefs that support this thinking. Replace them with thoughts and beliefs that are more rational and reasonable. With dichotomous (B&W) thinking, go for the grey where unrestrictive eating supports your choices. With absolutist “if then” thinking, replace “should” with permissive statements like can, is okay, may. With catastrophic thinking, treat yourself to hopeful coping statements that confirm your current and future happiness. With pessimistic thinking, make the cup half full. With linear thinking, switch to process thinking, which focuses on continual change and learning rather than just the end result. Pause in the middle of eating and ask yourself how the food tastes, and what your current hunger level is. Respecting fullness hinges on unconditional permission to eat when you are hungry. Comfortable satiety generally feels subtle, neither hungry nor full, content, but it feels different to each individual. To break autopilot, it helps to be hyperconscious of your eating experience. The initial step is conscious eating, a phase where you neutrally observe eating as if under a microscope. First, take a mini-time out from eating to regroup and assess where you’re at in your eating. This is not a commitment to stop eating but to be in check with your body, satiety, and taste buds. Are you continuing to eat just because it’s there? Do you feel unsatisfied? Is your hunger going away? Be patient, it takes time to get to know your satiety levels. When you finish eating, check your fullness level. This will help you identify your last-bite threshold, your endpoint. Don’t feel obligated to leave food on your plate – that is a remnant of the diet mentality. The commitment is instead to get to know your satiety level and your taste buds. It’s perfectly normal to opt to overeat and that’s ok. You may be testing the unconditional permission. When the newness wears off and the deprivation feelings subside, you’ll find it’s easy to leave food on your plate. Even when it comes to eating without distraction, Intuitive Eating is not another diet with rules to be broken. You are the one who has the internal wisdom about what works for you. You also know what doesn’t work. Be honest with yourself about whether you are able to get the most satisfaction in your eating while engaging in an activity, or whether you’re being distracted by it. Reinforce your conscious decision to stop. When YOU decise to stop eating, because you’ve reached the last bite threshold, it’s helpful to DO something tho make it a conscious act, such as gently nudging the plate forward or putting the utensils on the plate. Beware of air food: food that fills up the stomach but offers little sustenance like rice cakes or celery. A balanced meal has more staying power. Simply shoving some food in your mouth like a pacifier to ease hunger pangs may backfire, and the comforting effect will not be long lasting. The Japanese have the wisdom to promote pleasure as one of their goals of healthy living. When you eat what you really want, in an environment that is inviting, the pleasure you derive will be a powerful force in helping you feel satisfied and content. 1. Ask yourself what you really want to eat. You don’t need to eat a healthy dinner before eating the dessert you’re really craving. 2. Discover the pleasure of the palate in the here and now. 3. Make your eating experience more enjoyable by giving yourself a distinct time (15 min), sitting down at the table, taking several breaths before eating, eating slowly, sensually, savour each bite, put the fork down, and feel your fullness. 4. Don’t settle. One of the biggest assets is the ability to toss aside food that isn’t to your liking. 5. Check in: Does it still taste good? There will be times when you don’t have the option to get exactly what you want. Remember the concept of thinking in the grey because this is not a process that seeks perfection, but one that offers guidelines to a comfortable relationship with food. After all, it’s only one meal – you will survive! It’s how you jump back into taking care of yourself afterward that makes the difference. Sometimes honouring your hunger is the best you can do. There is a continuum of emotional eating from mild, almost universal sensory eat to comfort, distraction, sedation, and ultimately punishment with numbing, often anesthetizing eating. If food is the first and only thing that comes to mind when feeling bad, it can become a destructive coping mechanism. Food can also be used to distract from feelings which in turn blocks your ability to detect your intuitive signals or discovering the source of the feelings and taking care of your true needs. There is nothing wrong with sometimes distraction but food is not the appropriate distractor for temporary relief. First rule out basic needs: sleep, self-expression, sensual pleasure, intellectual stimulation, comfort, and being heard, understood, and accepted. You may need to go through a grieving period for the loss of food as comforter and companion. You may also find you’re experiencing your feelings in a deeper way since you’re no longer covering them up. Overeating is simply a sign that stressors in your life at that moment surpass the coping mechanisms that you have developed. It can also occur when your lifestyle becomes unbalanced with too many responsibilities and obligations, with too little time for pleasure and relaxation. It’s just an early warning system. Body vigilance begets body worry, which begets food worry, which fuels the cycle of dieting. As long as you are at war with your body, it will be hard to be at peace with yourself. Take care of your body. The emphasis is on healthy living and behaviours. Treat your body with respect, dignity, and meeting its basic needs. Rather than demeaning the results of your coping mechanism, respect yourself for surviving. My body deserves to be fed. It deserves to be treated with dignity. To be dressed comfortably and in the manner to which I am accustomed. Touched affectionately and with respect. And my body deserves to move comfortably. Beware of substituting a tight pair of jeans as a pseudo-scale or body-assessment tool. This can undermine how you feel about yourself. It can convey you haven’t made enough progress. Even a slender person will feel uncomfortable in a pair of paints that feel too tight. If you have a weight number in mind that comes from a time when you were dieting, this sheds information on how low your body weight was able to go under duress – which is not realistic. The more extreme the method, the less likely you were at a healthy weight as a result of that diet. Remember that research shows the actual process of dieting is probably more harmful than the actual body weight itself. Shift your focus to how it feels to move your body, such as energized. We define healthy eating as having a healthy balance of foods and having a healthy relationship with food. Eating selection is not a reflection of your character. Achieve authentic health with dynamic integration between inner attunement and external health values. It’s about variety, moderation, and balance. You don’t need to eat perfectly to be healthy. Protein rich food includes beans, seafood, chicken, turkey, nuts, and lean meats, eggs, and dairy. Nutrient dense foods include whole grains, avocado, nuts, and calcium-fortified soymilk. These quality foods are goals over time, which means even if you eat a candy bar, it will eventually average out. Play food is important for pleasure and freedom. Listen to your body to eat what feels good – all chocolate and only chocolate does not feel good. As BED patients so often have ignored hunger and fullness and are eating for many other reasons, asking them to listen for signals can be frustrating. The vision of a future free of obsessive thinking and compulsive behaviours is very powerful. Dieting leads to deprivation, deprivation leads to craving, and craving can lead to out of control behaviour. I eat whatever I want when I’m hungry and find that I’m more easily able to stop when I’m full. When I feel satisfied with what I eat, I eat less. I’m learning to cope with my emotions without using food. After hearing about the concept of intuitive eating all over the internet (youtube, podcasts, etc), I wanted to go back to the one of the original sources. I had some issues with certain aspects of the book, particularly I felt that the nutrition information related to fat was outdated. However, I still think the overall message of this book was wonderful and I certainly want to learn how to eat intuitively in my own life. I hate dieting. I detest counting calories or fat grams or carbs. I already find it difficult to squeeze grocery shopping into my hectic schedule so just the thought of adding any more time going label by label through the store, makes me seriously cranky. The minute I add a diet to my intentions, I find myself anxiously binging on my favorite foods in anticipation of their loss. And a few days into any diet, I swear I would mug a Girl Scout for her cookies! However, I am quite overweight (we ca I hate dieting. I detest counting calories or fat grams or carbs. I already find it difficult to squeeze grocery shopping into my hectic schedule so just the thought of adding any more time going label by label through the store, makes me seriously cranky. The minute I add a diet to my intentions, I find myself anxiously binging on my favorite foods in anticipation of their loss. And a few days into any diet, I swear I would mug a Girl Scout for her cookies! However, I am quite overweight (we call it plump in my house) and diabetic; my doctor is always on me to loose weight. What is a person to do? I really do NOT want to be hassled with the dieting frustration, but the anxiety of not taking care of myself, the encouragement from my doctor to drop even five pounds, the unintentional (or otherwise) pressure of friends and family who are all dieting, add up to unbelievable amounts of guilt. In an overture to alleviating some of this guilt, I recently attended a nutrition seminar during one of my lunch breaks. I must confess that I really had no intention of starting yet another exercise in proving just how little self-control I have, but I went. Everything the nutritionist said I’ve heard before. I know it all by heart. Blah. Blah. Yadda. Yadda. And then towards the end of the hour, she mentioned a book she highly recommended called Intuitive Eating: A Revolutionary Program That Works by Evelyn Tribole and Elyse Resch. In the material she distributed about the book, it had the catch phrase, “Free yourself from chronic dieting forever.” Well! That did catch my attention. I went back to my office and ordered the book. It was an excellent purchase. As it turns out, I am hardly the only person completely fed up with being guilt-ridden into diets that only serve to undermine my self-esteem and crank my weight up a few more pounds. And I discovered that some of what I considered my weirder eating habits are actually quite common. Complex feelings about this book. Overall, the idea is great and, if one has a diet mentality, very perspective shifting. However, because it is a valuable book, I feel even more inclined to offer critique so that the next book on this subject can be even more valuable. 1. This is a dated read. There is much talk about "normal weight", even while acknowledging that not everyone has the same weight that should be normal for them. There is still a sense that thin is better, while I feel the focus Complex feelings about this book. Overall, the idea is great and, if one has a diet mentality, very perspective shifting. However, because it is a valuable book, I feel even more inclined to offer critique so that the next book on this subject can be even more valuable. 1. This is a dated read. There is much talk about "normal weight", even while acknowledging that not everyone has the same weight that should be normal for them. There is still a sense that thin is better, while I feel the focus should be on health at every size. 2. The privilege in this book goes entirely unacknowledged. Eating what you crave, when you crave it, and having access to fresh, whole foods when you would like them is not the reality for many, many people. A lot of people have to eat what they can, when they can, or they don't get to eat at all. 3. There is a lot of nutrition information in here that gives it a "diet book" feel, while still saying over and over that diets are bad. This information was not necessary to the book, I feel. It is available in many other places, and it takes away from the value of the book, which is intuitive or mindful eating. 4. I felt like it doesn't take eating disorders seriously enough. It does say to work with a professional to help you get back to a point where you can trust your instincts, but doesn't give much practical advice on where to start with that. It just isn't the right book for someone a serious eating disorder, and it should spell that out clearly instead of hedging and then giving examples of recovering with intuitive eating. This book is actually excellent. I picked it up on a whim, interested due to a review of a friend of mine. I wasn't looking for a health book, I wasn't interested in changing my entire mindset on eating and food.... but this book has really shifted my view in so many ways. What the author is saying actually makes perfect sense. She has enough fact to back up her claims that I actually started doing some research and found out that not only are her claims grounded and credible, but they might be This book is actually excellent. I picked it up on a whim, interested due to a review of a friend of mine. I wasn't looking for a health book, I wasn't interested in changing my entire mindset on eating and food.... but this book has really shifted my view in so many ways. What the author is saying actually makes perfect sense. She has enough fact to back up her claims that I actually started doing some research and found out that not only are her claims grounded and credible, but they might be some of the most important things for people nowadays to know. This book was easy for me to get through. I struggled through "In Defense of Food" but this one had me interested and actually craving for more knowledge. One of my favourite non-fiction books I've ever read! I think everyone should read this! Please read this book if you have body image issues or struggle with dieting and loving your body! I wish I picked it up sooner as it is just an impactful and important read that has become a favourite read of mine this year. Now I never thought I would say I am on a ‘diet’ but seeing everything that they mention is technically a ‘die One of my favourite non-fiction books I've ever read! I think everyone should read this! Now I never thought I would say I am on a ‘diet’ but seeing everything that they mention is technically a ‘diet’ made me see my own eating habits as something I really need to work on. As restricting myself of foods I love and placing a time stamp on times I can eat is a form of restriction and a diet as you are placing rules on your eating. I have learned so much about eating from this book and it isn’t even the longest non-fiction that I have ever read. Of course, picking up this book entails that I deep in my subconsciousness knew I really have to work on my eating as it is definitely a part of my lifestyle that frustrates me and kind of bring up my depression. I love how becoming an intuitive eater is done in steps and there isn’t a specific time frame to accomplish this goal. Since starting this book I have already started to notice changes in my well being and even though I am eating whatever I want, I don’t see myself doing what I used to do which is one, feel bad about eating foods I thought I shouldn’t, and two, as now I know these foods aren’t “forbidden” I don’t eat as much of them (aka stuff myself to the point of making myself kind of sick) which is a very big step as I have been struggling with this for a couple of years now. I know I still have a long way to go but ever since reading this book I have not looked at my body (too much) in a negative light and see the things I love about myself. But the most important thing is that I don’t look at food as the enemy and I’ve started walking again which is definitely helping my self-esteem, by walking I mean going on long walks. Also, I loved how this book tackled veganism/vegetarianism, going into this book I thought it would mention it as a restriction which if you look at it properly it kind of is, but even though the section is tiny on this matter it said exactly what I needed to hear it say – if you are doing it for the right reasons (aka ethical) then it is totally fine but if you are using it to lose weight then you will get meat craving (which I never have had). Please just pick this book up as I really want everyone to read it! ...on the other hand, there is so much information that is just completely unnecessary. Ok, they might be helpful for people who have no idea about diet/health books. But for people who tend to regularly read books in this category or who already have some knowledge of nutrition, it is not necessary to read about protein/carbs/fats etc. And also, for people who are consciously trying to reject diet culture and are aware of how magazines/ads etc. work, some information might also seem kind of boring. As this book tries to help those who are stuck with crazy diets/diet mentality/ or even eating disorders, one might expect that these people already have some knowledge. In my opinion, it is enough to read the last chapter, which gives you an 'overview' of all the principles. What it actually does (to me): it gives you everything you need to know without the (sometimes annoying) examples. So basically, this book could be reduced to 20 pages maximum. HOWEVER, I can recommend this book to ANYONE who is sick and tired of being manipulated, and especially to young girls!!!!! It is so easy to become obsessed with certain food rules and beliefs (especially with YouTube now being a big business and people promoting different kinds of diet as THE ONLY RIGHT ONE). It is so easy to limit oneself, to become obsessed, to form rules and once you 'break those rules', even just slightly, everything escalates. But if you just consider for one second what it actually DOES, what breaking this rule (i.e. eating a bit more, eating some excessive calories) actually does to your body, it's nothing. And it's ridiculous to punish oneself for it. I also really liked the way that the authors talked about exercise and fitness: People need to learn to see exercise as a separate thing from food. They asked a question, something like, how often do people think 'Oh, I ate so poorly today. I ate so much.. even working out won't solve that..' or 'only 10 minutes of a workout is not worth it.' or 'going for a walk does not burn enough calories etc.'. people need to see that while excising can be used as a tool in a diet, it is also separate from it. Because all those things mentioned above do not matter at all, if you consider for only one moment, what exercising means for your BODY and health, and not necessarily for body aims/diet aims. 10 minutes of slowly walking is STILL good for you, for your heart, even if it might not burn so many calories. And so on. I can say that I like the principle behind this book, and while I agree with everything the authors do say, I don't think that someone who has read the book is ready to change. It is not motivational enough (yeah, the reader must make the decision himself/herself, but still.). I expected some more guidance, too. Some more 'easy tools' to use during the process. I believe that people have forgotten how to eat intuitively, and that diet culture and 'health movements' have totally messed up our ways of thinking. While I can at least somewhat proudly say that I really don't fall for any of those supposed-to-be-healthy-diets and products, and I don't fall for any ads/campaigns/'sucess stories) anymore (hey, it's been a loooong loong way..), TOO MANY PEOPLE STILL DO. And it is those people that NEED to read this book ASAP! We have made everything WAY TOO COMPLICATED, way too restricted. We constantly fight to find THE SOLUTION, THE ONLY RIGHT WAY. And all the while, we forget what eating is actually all about: nurturing our bodies and spirit/souls (whatever you want to call it). The book states a lot of facts that makes the reader think about eating. The simple process of eating that has become such an obstacle for way too many people. This book has completely changed the way I eat. I have always considered myself a positive, upbeat person who is kind and loving to everyone including myself. This book showed me how I was denying myself food and torturing myself every time I ate. I was not being kind to me. No more dieting. No more denying myself food because it is "not good for me". It is just like she says in the book --if you tell a child they can play with any toy in the room but the pink elephant, the pink elephant is the o This book has completely changed the way I eat. I have always considered myself a positive, upbeat person who is kind and loving to everyone including myself. This book showed me how I was denying myself food and torturing myself every time I ate. I was not being kind to me. No more dieting. No more denying myself food because it is "not good for me". It is just like she says in the book --if you tell a child they can play with any toy in the room but the pink elephant, the pink elephant is the one they want. At first, I was buying all the candy and cookies and cake I could and eating whole milk and whole cheese and ice cream galore and bread---ohhh baguettes and croissants and fresh bread in my bread machine (which was gathering dust in the back of the cupboard). But, to my surprise, that intense period of gorging after years of denial truly did not last long. Once I tasted everything, it was good, but not the fantasy I imagined it to be. I can throw food away with glee and if it doesn't taste "out of this world" it is not worth eating. I relish my food and glory in every bite. I am still learning to trust my body and to know when I am hungry and not let myself get too hungry before I eat. I am learning when I am getting full and stopping and checking with my body. I still eat sometimes when I am not hungry, but I am more aware. I am embarrassed and ashamed of how I have treated my body all of these years. I am making peace with my body and accepting that my shape and weight after two children and menopause is not the same as when I was in my 20s and it doesn't have to be. I am not stepping on the scale any more and have no idea what I weigh. Thank you. Thank you. Thank you....for writing this book Evelyn Tribole. It took me a long time to read this book, mainly because I read it very slowly so that I could absorb all of the concepts. This book is all about making peace with food and with the body you have. It is not another diet book; in fact, the main theme of the book is the necessity of rejecting the "diet mentality" once and for all. The authors point out that almost all diets eventually fail, and most people chastise themselves for not having the “willpower” or “self-control” to be successful on a d It took me a long time to read this book, mainly because I read it very slowly so that I could absorb all of the concepts. This book is all about making peace with food and with the body you have. It is not another diet book; in fact, the main theme of the book is the necessity of rejecting the "diet mentality" once and for all. The authors point out that almost all diets eventually fail, and most people chastise themselves for not having the “willpower” or “self-control” to be successful on a diet. Intuitive Eating states firmly that the blame should not be placed on the dieter, but rather the diet. In a nutshell: DIETS DON’T WORK! The Intuitive Eating process consists of learning to trust yourself and your body by interpreting and honoring your own internal cues. As any chronic dieter knows, this is very different from what most dieting “experts” tell you. Through reading this book, I definitely realized that my “relationship” with food has become very twisted over the years, and I have a lot of negative (and false) beliefs about food and my body. This book offers a plan to overcome the thought distortions and regain control of eating habits and body image. It also addresses issues of nutrition and exercise, and offers a new (guilt-free) way of looking at both. I personally have a lot of work to do, but for the first time in a long time, I feel like I might be back on the right path! I would recommend this book to anyone who wants to regain a healthy relationship with food and learn to honor and respect the body you have. I debated entering this here, as this is more about my eating issues than literature. But hey - it was a book I read and ill likely read again soon, so I added it. It's basically about reteaching ourselves to eat when we're hungry, and to eat what we want. Sounds simple, but I find I really have to think about it and not just eat because it's 9AM or Noon, etc. It's also about eating "real food." I'm no longer fixating on low-sugar, low-calorie, fat-free stuff. I'd rather eat creamy vanilla yogurt I debated entering this here, as this is more about my eating issues than literature. But hey - it was a book I read and ill likely read again soon, so I added it. It's also about eating "real food." I'm no longer fixating on low-sugar, low-calorie, fat-free stuff. I'd rather eat creamy vanilla yogurt and feel satisfied than eat nonfat watery yogurt that doesn't fill me up and makes me want to eat more calories in the long run. It's also OK to be ravenous one day and not very hungry the next. I really needed to read that, as I feel like a failure on days I eat a lot. Now I realize that it's normal to go through these hills and valleys. This book has helped me in recovery from my Eating Disorder. It's what they teach at one of the top Eating Disorder facility's in the world. It. is. AMAZING. Get back in touch with your initial intuitive eating skills, that came to you so naturally as a child. Eat what you really want, when you really want it. Enjoy food. Get to your natural healthy weight and love your body. Stop obsessing and start living! (Make sure you read the latest edition, which right now, is the third one.) This book has really helped to open my eyes to the insidious, pervasive danger of diet culture. It has shown me what I was putting my body through, for no reason, in the pursuit of an ideal that doesn’t really exist. I feel like I’ve been rehabilitated from a cult. I highly recommend this book if you have been dieting but yearning to be able to stop caring about every bite you take. I typically thumb through self help books, but listened to this in audio form. So glad I did. If anyone has felt like they've failed at diets, welcome to the way you're supposed to eat-without guilt and shame. Evelyn was the nutrition expert for Good Morning America, appearing from 1994-’95 and was a national spokesper Evelyn Tribole, MS, RD is an award-winning registered dietitian, with a nutrition counseling practice in Newport Beach, California. She has written seven books including the bestsellers Healthy Homestyle Cooking and Intuitive Eating(co-author). Her newest book is the Ultimate Omega-3 Diet. As a speaker, Evelyn is passionate and has been called, "Wonderfully wise and funny", whether providing a keynote or full-day workshop.